Ke’Mon Freeman ran for three touchdowns and Xavier Jones added two more as SMU held off UConn’s comeback attempt, winning 62-50 Saturday afternoon at Pratt & Whitney Stadium in East Hartford. Against a UConn defense that came into the game allowing 627 yards of total offense per game, SMU’s offense thrived. For the second week in a row, SMU was able to find yards on the ground. First, it was Freeman. He gained a season-high 107 yards against Houston in SMU’s last game and picked up right where he left off Saturday in East Hartford. He broke four tackles on a 39-yard touchdown run that put SMU up 10-0 in the first quarter. On the next drive, he bullied his way inside for a five-yard touchdown that put SMU up 17-7. Freeman finished the day with 116 yards on 17 carries and three touchdowns. Xavier Jones, who was averaging just three yards per carry coming into the game, was the lightning to Freeman’s thunder, recording a season-high 133 yards on just 11 carries. He thrived in the second half, scoring on runs of 52 yards and 43 yards. As a team, SMU ran for 315 yards on 39 carries – a season high. Junior quarterback Ben Hicks’ performance made SMU’s offense all the more versatile. After having his best game of the season against Houston last week, Hicks completed 19 of 29 passes for 276 yards and a touchdown. Most importantly, he didn’t throw an interception. Since he was benched against Michigan, Hicks has thrown 16 touchdowns and just four interceptions. SMU led 31-10 at the half, but UConn quarterback David Pindell led his team to a 34-point second half. 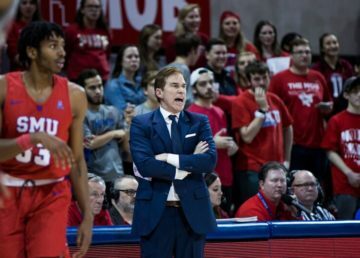 Pindell’s scrambling ability gave SMU’s fits. He ran for 181 yards on 21 carries. SMU continued to key on him when the Huskies ran the read option and that led to holes for running back Kevin Mensah, who gained 184 yards on 28 carries. The 365 rushing yards that SMU gave up were most that the team has allowed all season. But every time UConn scored in the second half, SMU was able to respond. When UConn pulled within eight with 10:18 left in the half, the Mustangs scored on a four play, 62-yard drive. The key play on the drive was a run by Hicks, who kept the ball on a fake and ran 51 yards inside the UConn five-yard line. One play later, Freeman found the end zone for the third time, this time from three yards out. The Huskies scored once more with less than a minute left, but it was too little, too late. SMU’s 594 yards of total offense was its second-highest output of the season and highest against an FBS opponent. The Mustangs last scored more than 60 points against an FBS opponent in 2012, when they scored 72 against Houston. At 4-2 in conference play and 5-5 overall, SMU just needs one more win to reach a bowl. In addition, it is just one game behind Houston for the lead in the AAC West. If SMU were to win its next two games and Houston loses one, SMU would win the division. The Mustangs take on Memphis next Friday at Ford Stadium. Kickoff is set for 8 p.m.